I’ve been “face first” with Washington D.C.’s endless capacity for fiscal profligacy for nearly five decades now, starting with my time in Congress right up through my experience running the Office and Management and Budget (OMB) for Ronald Reagan. February was month No. 116 of the current recovery. We’re just three months from matching the all-time-record. That previous run, 119 months, happened during the far more benign environment of the 1990s technology boom. To our knowledge, there’s never been a textbook written – even by the most rabid Keynesian scribbler – that recommends borrowing such an ungodly share of outlays at this stage. We are talking “ungodly” here. Let’s remove the short-term anomalies in the February figures. Let’s pull back and look at the full fiscal year to date. From October, Uncle Sam spent $1.819 billion and collected just $1.282 billion. That’s $537 billion of red ink. That’s 30% of outlays. And it embodies the lunatic fiscal policy adopted by the Trumpified GOP during the 22 months of Deep State distraction known as Russiagate. Call it “The Four Horsemen of Fiscal Apocalypse”… a ballooning Welfare State… a booming Warfare State… soaring interest expense… rock-bottom revenue from a flat-lining economy. These four factors are ransacking the long-term U.S. fiscal equation – with more evidence piling up during the first five months of fiscal 2019. In round terms, spending grew by 6% and revenue 0% compared to fiscal 2018. And last year wasn’t an aberrational low, given that it ended with a $779 billion deficit equal to 3.8% of gross domestic product (GDP). The details underscore the true disaster. Social Security/Medicare outlays were up by 5%. Defense spending was up 9.5%. Veterans care was up 10%. And the interest cost on the public debt was up 10.5%. On the other hand, individual income tax collections were down by $20 billion, or 3%, from last year. Corporate receipts dropped by $14 billion. That’s a whopping 19.2%. These plunges happened notwithstanding a 4.5% increase in wage and salary incomes and flat pre-tax corporate profits during this year’s first five months compared to last year. Spending is more out of control than ever. And the Donald’s and the GOP’s tax cuts aren’t paying for themselves, and it’s not even close. That’s evident from the White House budget projection for fiscal 2019. Yes, it’s a “Rosy Scenario.” Its key assumption is a 5.2% gain in nominal GDP. That’s not remotely likely. Even this “Rosy Scenario” predicts revenue growth of just 3.2% versus spending growth of 10.2%. The math doesn’t lie. Trump’s OMB projects a $1.1 trillion deficit for fiscal 2019. That’s 5.1% of GDP. Another way of saying it is the guy who used to do my job is forecasts an off-the-charts borrowing requirement right at what all data suggest is the end of the recovery from the Global Financial Crisis/Great Recession. 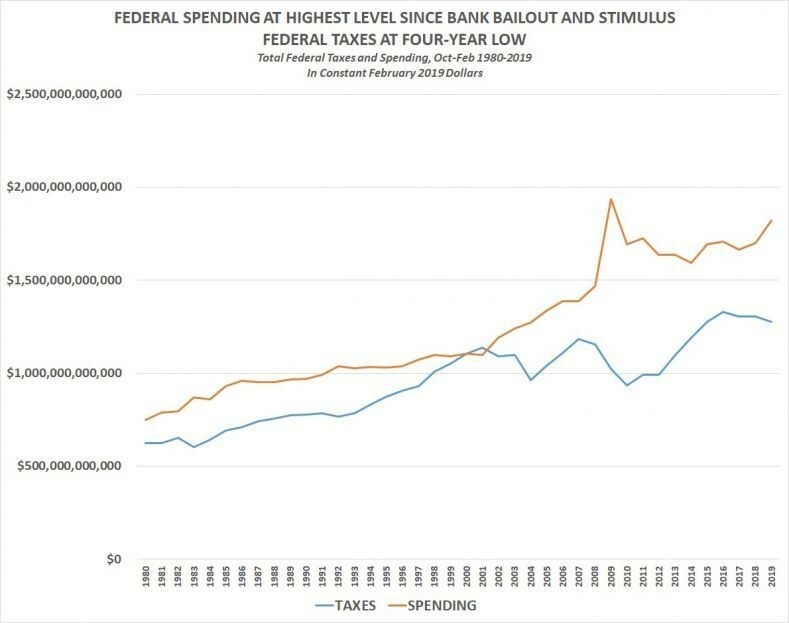 Embracing spending program at 21% of GDP while boasting about a revenue policy of 16% of GDP – with credit-card financed tax cuts – is irresponsible at any point in the cycle. Doing it while an old and weak recovery rolls over is madness.